Hey friends! How’s your summer calendar looking? Mine is getting fuller every day! Between traveling and kids’ jobs and swimming and friends and trying to squeeze in some home projects, summers can get so full that by the end we are wondering what happened to all of our free time! 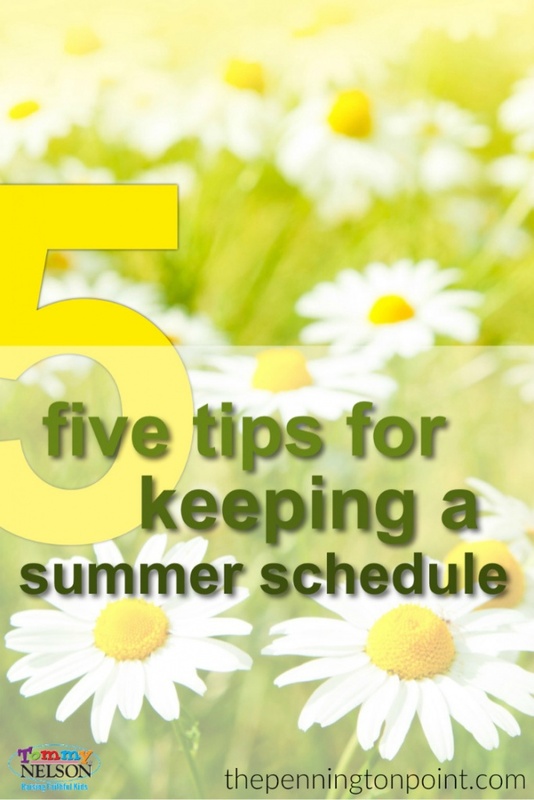 With a houseful of activity around here, I have come up with a few tricks to making a summer schedule easier to manage. Keep a calendar that everyone can see. Our family uses an app that works for everyone with a smartphone. As each of us makes a plan, we can check the app to make sure it doesn’t conflict with anything else going on. When one of the kids comes to me and says they need to use the car or won’t be able to fulfill a family obligation (“I can’t do the dishes on my night because I’m going to my friend’s house.”) I tell them that if it’s not on the app, it isn’t happening. You can’t count on all of us making sure you’re covered if we don’t even know what your plans are. In addition to the app, we keep a list of the week’s activities on a giant white board. The board hangs on the wall in our hallway…not pretty but VERY useful. Each Sunday I erase the previous week’s schedule and start a new one for the next week. I write down everything that’s on the app and then small things that wouldn’t be there, like home projects. Maybe I want to try to clean out the garage on Wednesday….that would go on the board list. This list makes it possible for the entire family to see at a glance what’s going on, even those who don’t own smart phones. And the younger kids can write in their plans on the board too. Schedule time for doing nothing. If we don’t make sure there’s down time in the schedule then we might miss it. Just like our bodies need sleep and rest, our family life needs rest too. Each week I leave gaps in the schedule and days with nothing going on. By gaps, I mean I actually write on the schedule, “Do nothing” so it doesn’t get filled in. On those days we just hang out together. We sit on the porch, lie around, go for walks, talk, play games, just chill. Make a simple chore schedule. Let’s face it, the house has to get cleaned at some point. So make a simple chart of who/what/when. It doesn’t have to be fancy, just tear out a piece of notebook paper and write on it. The days of the week across the top and the jobs down the page and start filling it in with people’s names in the middle. If everyone does a few small jobs each day then it’s easier to keep up with. This makes the schedule flow more easily because the household chores are getting done and not hindering extra activity. Even the younger kids need jobs, so don’t leave them out of the chores! Connect as a family every day. Crazy schedules can lead to relationship breakdowns. The trick is to make sure you’re connecting with each person, even the littlest members of the bunch, every day. Kids feel lost in the shuffle when they’re being dragged around or fed on the go. Be sure to connect as a family by eating meals together, turning off the TV, gathering each morning to be sure everyone is heard. Talk, look, listen. Read a book together! Speaking of connecting, reading books together as a family is not only a great connector, but builds great memories. There are so many great summer reading programs for the kids. But why not do some summer reading as a family?! Pick three books you’d like to read together and do one each month for the summer. I’d suggest choosing one classic, one new book and one that’s Bible focused. That makes it more interesting! Some great family read aloud ideas are, “Bonhoeffer: Pastor, Martyr, Prophet, Spy” by Eric Metaxas or the “Dreamtreaders Trilogy” by Wayne Thomas Batson. And don’t forget to add some Bible reading to your time of reading together. 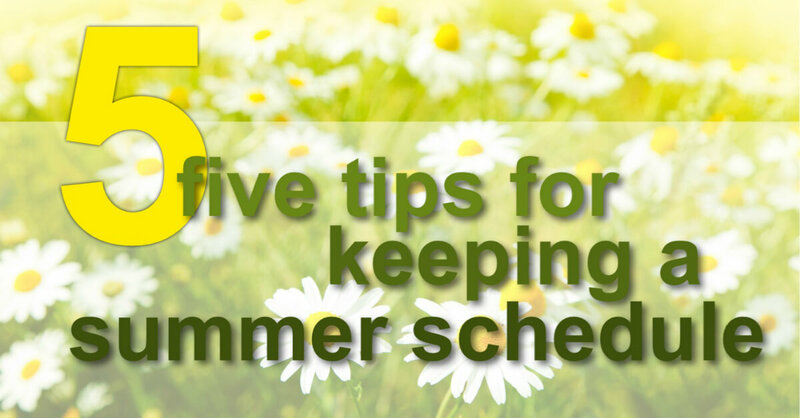 By doing these simple five tips for keeping a summer schedule, your days can sail along much more smoothly. Do you use a family calendar? What are your best summer schedule tips? This entry was posted in Blog, Tommy Nelson and tagged Family, Lisa Pennington, Organization, Summer, Summer Books, Summer Schedule by Lisa Pennington. Bookmark the permalink. Will All The Good Fathers Please Stand Up?